The Pacific War Online Encyclopedia: Calhoun, William L.
Naval Historical Center #NH 58457. "Uncle Bill" Calhoun graduated 12th in the Annapolis class of 1906, qualified as a submariner and served on battleships, but ultimately became the U.S. Navy's master of logistics. 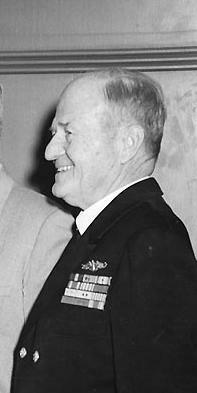 He was commander of Service Force, Pacific Fleet, throughout the war, rising to the rank of vice admiral. The Service Force itself became a vast fleet of of 290 auxiliaries providing the logistical support that made the Central Pacific offensive of 1943-1945 possible. Calhoun had commanded Young during the Honda Point Disaster of 8 September 1923, when his destroyer squadron ran into a reef due to a navigational error by the lead destroyer. Young capsized after grounding, but Calhoun ordered the crew to make for the port side of the ship and remain there to await rescue rather than abandon ship. Calhounwas later commended for his leadership and credited with saving three-quarters of his crew. Calhoun was criticized by King for developing the fleet train at the expense of neglecting the development of forward naval bases. Nimitz insisted that Calhoun be given a fighting command, and he ended the war in command of South Pacific Area, which had long since ceased to be an active combat zone.